Mia Modern Bathoom Vanity Set 47"
Name: Mia Modern Bathoom Vanity Set 47"
The Mia is a beautiful modern bathroom vanity set with a stylish wide wash basin. 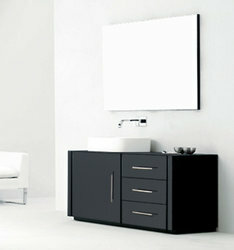 Elegant modern bathroom vanity design with a contemporary Euro Italian character. 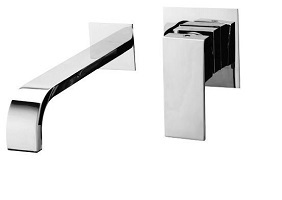 Fashionable with wall mounted faucet and a large wall mounted mirror. Plenty of storage with 3 drawers on the right side and a large storage cabinet on the left. Finely hand crafted from solid Rubber wood (from the Rubber Tree) with a protective water-resistant finish. Chic Euro Style with a black finish.